The title of this blog is a translation of the French contrerimes - a verse form invented by the poet and novelist Paul-Jean Toulet (1867-1920) and also the title of his single and singular collection of poems. In this work there are 70 contrerimes proper, 14 Chansons,12 Dixaines, and 109 Coples (not, I assure you, couplets.) This blog will present them from time to time, in no particular order, with an attempt to render them into English with as much attention to the inherent poetry as I can achieve. I hope some readers will suggest improvements and alternatives. To start, I am posting perhaps his best-known poem, the first of the chansons, and the first of four ROMANCES SANS MUSIQUE. It is En Arles. Les Alyscamps is a long avenue bordered by cypress and poplar trees, and lined with numerous Roman marble sarcophagi. It was once part of a vast cemetery complex surrounding the town, and believed to be the largest collection in Western Europe outside Rome. The first bishops of Arles were buried here. Some of the sarcophagi have been removed and are housed in museums and churches in Arles. Both Van Gogh and Gaugin were inspired by the beauty and atmosphere of Les Alyscamps. The church of Saint-Honorat lies at the end of the avenue. It was originally the site of a priory built in 1040, which was replaced a century later by the Romanesque church. Les Alyscamps is of course basically Champs Elysée backwards. 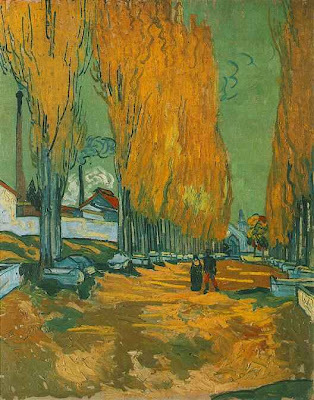 The cemetery was painted both by Van Gogh and Gauguin. Van Gogh painted it at least four times - this version, in the Goulandris collection, was completed in 1888, and shows a view down the Allee des Tombeaux, the poplar-flanked path between rows of ancient sarcophagi, in which Vincent van Gogh portrayed two lovers taking a stroll. The woman in Les Alyscamps wears the distinctive local costume, while the man's uniform identifies him as a Zouave whose regiment was temporarily billeted in Arles. This adds a poignant note to Vincent van Gogh's's favorite motif of companionship. Soon the soldier would move on, and the relationship would end. "Dans Arles, où sont les Aliscams,"
"Prends garde à la douceur des choses." Ici, seconde personne de l'impératif présent, sans incidence sur la prononciation du vers. "Lorsque tu sens battre sans cause"
Erreur de frappe sans incidence sur la sonorité du vers. Félécitations pour vos pages qui rendent hommage à un poète faussement léger et si mal apprécié de nos jours. Edition de Michel Décaudin, NRF Poésie/Gallimard. Présentation par Jean-Luc Steinmetz, GF Flammarion 2008. Paul-Jean Toulet. La Vie - L'Oeuvre - L'Esthétique. 2 vols. Daniel Aranjo, Marrimpouey, Pau, 1980. Versión, prólogo y notas de Jorge Gimeno. Colección la Cruz del Sur. Editorial Pre-Textos, 1998.